In May of 2015, the Federal Trade Commission (FTC) released the results of a three-year study into the lucrative pet medication industry. The market for veterinary medicines has shown significant growth in recent years and has become a very important component of the veterinary industry as a whole. Prescription and over-the-counter dog and cat medications reportedly brought in more than $7.6 billion in 2013. Sales of such medications were projected to increase to a staggering $10.2 billion by 2018. For many years, veterinarians enjoyed a near monopoly on veterinary prescription and over-the-counter drug sales. Beginning in the late 1990s, non-veterinary medication providers (both brick-and-mortar and online retailers) started to take control of a larger market share. While they certainly face increased competition from these sources, veterinarians still sold more than half (58 percent) of pet medications in 2013. 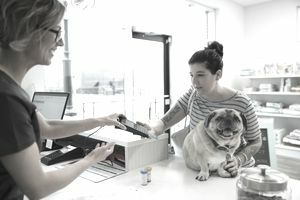 Brick-and-mortar retail storefronts account for 28 percent of pet medication sales, while online or mail order retailers account for the remaining 13 percent. It is important to note, however, that just two years previously vets accounted for 63 percent of pet medication sales. Retail competition appears to be growing at a strong rate. So what does this increasingly competitive pet medication marketplace mean for veterinarians? The competition from non-veterinary retailers can take a considerable bite out of veterinary profits. The FTC report noted that approximately 20 percent of a clinic’s revenue is derived from pet medication sales on average. While many owners are still not conscious of the fact that they can simply request a prescription from a vet and have it filled online or through a big box store, the increasing market share for retailers indicates that this is changing. As clients seek service elsewhere, vets stand to lose a significant part of their traditional practice income. Veterinary prescriptions and over-the-counter medications are often marked up significantly to drive revenue for the practice. The proliferation of non-veterinary retailers has driven down the prices of certain readily accessible prescription and OTC products. The markups on certain pet medications, particularly flea and tick control products and heartworm preventatives, have been reduced at most veterinary practices to compensate for the lower rates available at retail stores. Flea and tick products are only marked up at a rate of 78.2 percent, while heartworm preventatives are marked up 82.9 percent; many veterinary products can be marked up 100 percent or more from manufacturer prices. Veterinary medication markups help offset the costs of comprehensive clinical care and diagnosis. If this income is reduced, vets may have to increase prices for exams and other services to meet their overhead costs of staying in business. Some less ethical practitioners might be tempted to run additional tests and perform additional procedures to increase revenues. Veterinarians save time and administrative costs by not having to write prescriptions for medications that will be filled in-house. Documenting a large number of prescription requests can dramatically cut into those savings. There is also a piece of pending legislation known as the Fairness to Pet Owners Act, which would require veterinarians to write every prescription out and provide it to the owner (even if the owner does not wish to receive this documentation or fill a prescription elsewhere). There is concern that human pharmacists may not be well informed about veterinary pharmacology and potential errors or drug interactions. While veterinarians have long utilized retail pharmacy suppliers for certain specific needs, such as dispensing human generic drugs that are also prescribed for use in animals, exclusively veterinary products are a newer arrival in the human pharmacy environment. The “gray market” for veterinary medication does exist. While veterinary product manufacturers primarily (or exclusively) sell their products directly to vets, those products do seem to leak to retail storefronts or online sellers through a secondary market. Additionally, some manufacturers claim not to sell to non-veterinary retailers but seem to engage in the practice. This is also referred to as “diversion” of veterinary products. These sales may benefit some practitioners financially if they engage in reselling, but on the whole such “gray market” sales tend to lower the market value of drugs.